In the U.S., there are 51 metropolitan statistics areas with populations of 1 million or more each. The 2017 and 2018 values of construction ‘starts’ in those 51 cities are set out in accompanying Tables 1 and 2. Table 1 ranks the cities according to 2018 dollar-volume levels; Table 2 ranks them by 2018-versus-2017 percentage changes. The starts figures have been calculated by ConstructConnect. 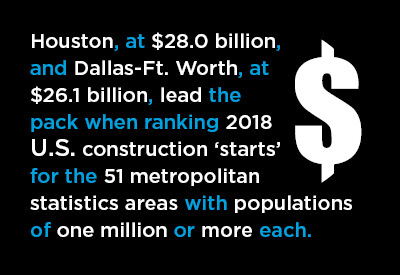 In Table 1, in the 2018 dollar-volume column, two cities in Texas lead the pack: Houston at $28.0 billion and Dallas-Ft. Worth at $26.1 billion. 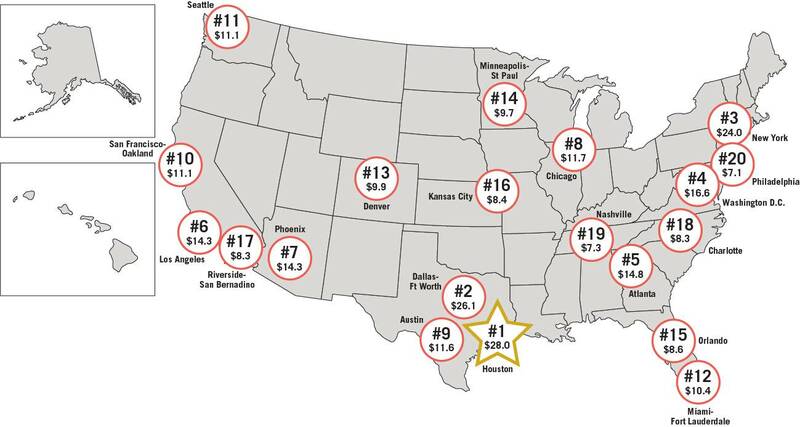 New York ($24.0 billion), Washington ($16.6), Atlanta ($14.8), Los Angeles ($14.3), and Phoenix ($14.3) also score well in Table 1’s ranking. Data Source and Map: ConstructConnect. There is a city with less than a million people that would otherwise have appeared prominently in Table 1. It would have made it into position 12, displacing Miami, thanks to the initiation of work on one, particularly large project. In 2018, Racine, Wisconsin, was the beneficiary of a $10 billion investment launched by Taiwanese electronics giant Foxconn Technology Group. Lately, there has been uncertainty about the type of activity that will take place at Foxconn’s new Racine facility. The plan, when first conceived, was that it would manufacture liquid crystal display (LCD) screens for television sets. But there has been a shift in thinking by the company’s brass towards more of a focus on research and development. Such a move would suggest a downsizing in scale. President Trump has been talking with the folks at Foxconn, trying to convince them to stick with their manufacturing intent. In any event, the company is saying it is committed to eventually providing the 13,000 jobs touted in its original proposal. In Table 2, Providence led all cities in year-over-year percentage change in starts in 2018, at +71%. Kansas City (+47%), Cleveland (+45%), and Memphis (+34%) also turned in stellar performances. But most of the cities at the top of Table 2 made their large gains relative to low base volumes in the year prior. The most impressive increases in 2018 were made by metro areas that moved beyond already good volumes of groundbreakings in 2017 – Austin, +21%; Houston, +15%; Phoenix, +13%; and Denver, also +13%. Canada has six cities with populations above 1 million residents each. Ottawa-Gatineau, $1.9 billion CDN ($1.4 billion USD), -15% y/y. If they had been included in Table 1, Toronto and Montreal would have appeared among 2018’s Top 15.